April 11, 2018 (Joseph Thomas - NEO) - Vietnam has tried and imprisoned several members of a US-funded network engaged in sedition across the country. The move follows trials and prison terms handed out earlier this year for other US-funded operatives meddling in Vietnam's internal political affairs. 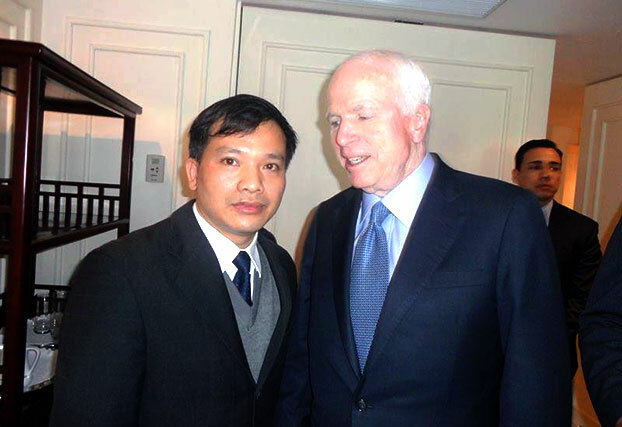 Image: Nguyen Van Dai, recently sentenced to 15 years in prison, is pictured with US Senator and chairman of the International Republican Institute (IRI) John McCain in the US Embassy in Hanoi, Vietnam. The IRI provides money to foreign agents of US influence and is a subsidiary of the National Endowment for Democracy (NED). The prison terms for agents of US-funded political meddling in Vietnam come as the US and its European allies continue pushing accusations of Russian meddling. However, unlike the US and Europe's accusations against Russia, agents of US-funded sedition in Vietnam are exposed by extensive evidence, much of which comes from the US government itself. Six prominent Vietnamese activists have received heavy prison sentences on charges of "attempting to overthrow" the country's communist government. The article mentions Nguyen Van Dai and his fellow defendants' role in founding the so-called "Brotherhood for Democracy." Dai founded the Committee for Human Rights in Vietnam in 2006 and was sentenced to five years in jail in 2007 for spreading propaganda against the government. While his term was reduced to four years on appeal, his lawyer's license was revoked. After his release in 2011, Dai co-founded the Brotherhood for Democracy network in 2013. It included other, formerly jailed dissidents advocating via social media for human rights throughout Vietnam. They were all accused of "activities aimed at overthrowing the people's government," according to the indictment issued by the Supreme People's Procuracy in Hanoi last December. The charges included carrying out human rights training, calling for multi-party democracy and receiving funding from foreign groups. The BBC, DW and other US and European media organisations went through extensive efforts to avoid mentioning US training, funding and other forms of support provided to Nguyen Van Dai and other recently arrested and jailed "activists." The defendants' various website also fail to directly and openly disclose their funding. However, admissions have been inadvertently made. While the US National Endowment for Democracy (NED) website lists 11 programmes being funded in Vietnam as of 2017, descriptions are left intentionally ambiguous, failing to disclose any organisation or individual actually receiving the funds. Disclosures for previous years have since been deleted from the NED website. Opposition website "The 88 Project" in a post titled, "Vietnam Free Expression Newsletter No. 5/2018 – Week of January 29-February 4" would report on the imprisonment of Tran Hoang Phuc, Nguyen Van Dien and Vu Quang Thuan earlier in 2018. Phuc is admitted to have been a participant in the US State Department's Young Southeast Asian Leaders Initiative (YSEALI). YSEALI indoctrinates young people across Southeast Asia, often helping them organise and fund subversive operations posing as "nongovernmental organisations" (NGOs). Radio Free Asia (RFA), a US State Department-funded media front producing propaganda aimed at the Asia-Pacific region, would describe the Brotherhood for Democracy as a successor to another prominent opposition group in Vietnam, Bloc 8406. A group of mostly former jailed dissidents in Vietnam have set up a new online group to coordinate efforts to bring democracy to the country, now under one party communist rule. The movement, known as the "Brotherhood for Democracy," was established about 10 days ago and the membership has grown to 70 so far. The biggest online Vietnamese group pushing for democratic reforms is Bloc 8406. It was organized across the country in 2006, but many of its leaders, including co-founder Roman Catholic priest and dissident Nguyen Van Ly are languishing in prison. However, Radio Free Asia, like other US and European media organisations, failed to disclose the group's funding. US diplomatic cables disclosed by Wikileaks would reveal that many involved in Bloc 8406 were recipients of US government training and funding. Dissident attorney Le Quoc Quan, who was detained for 3 months in 2007 after completing a fellowship with the National Endowment for Democracy in Washington, DC, has his own blog (www.lequocquan.blogspot.com). Over the past year, Lawyer Quan has posted many articles critical of the government's handling of last year's Catholic protests at the Thai Ha parish and the September-October arrests of at least 13 activists associated with the dissident political movement Bloc 8406 (reftel). And while NED had deleted past financial disclosures regarding Vietnam, NED's e-bulletin, "Democracy Digest," has several archived articles that offer clues. Oh yes, that was back in 2006. Dai got invited by the NED (National Endowment for Democracy). "Democracy Digest" would also admit in a 2009 post entitled, "Vietnam stifles dissent in advance of party congress," that the Vietnam Committee on Human Rights or "Que Me" is a grantee of the US National Endowment for Democracy. Despite the similar names, this latter organisation does not appear to be the same one founded by Dai in 2006. It does, however, directly support and defend the activities of Dai and his organisation, including a recent article decrying his lengthy prison sentence. It is also recalled that Lawyer Nguyen Van Dai is a human rights lawyer who regularly defends the victims and those who are oppressed in Vietnam. He is also a blogger of the RFA Asia Free Press. Thus, while the US and European press reported Vietnam's accusations that Dai and his collaborators were recipients of foreign funding and served as agents of foreign interests, they failed to include known information of Dai's role working on behalf of the US government. However, as mentioned before, Radio Free Asia is funded and directed by the US State Department with the US Secretary of State serving as a board member. RFA's own article admits that Dai is a "blogger" working for RFA, and thus serving under the direction RFA's board of directors, including the US Secretary of State. It should also be noted that McCain sits on the board of directors of the International Republican Institute, a subsidiary of the National Endowment for Democracy. It is unlikely McCain would have met with Dai in the US Embassy in Hanoi if Dai was not a recipient of US funding and an agent for US interests. The irony is that the lengthy prison terms come at a time when the US needs Vietnam the most. The US has faced growing indifference across Southeast Asia regarding its attempts to recruit the region into encircling and containing China. Vietnam has emerged as one of the few nations willing to engage with Washington in an overt gesture to check Beijing's growing influence. Image: The US finished grandstanding after the USS Carl Vinson docked in Vietnam in a historic visit hailed as a move putting "China on notice." The political capital this granted Vietnam appears to have been immediately used to liquidate key figures in US-funded networks aimed at compromising and pressuring Vietnamese policymakers. However, Vietnam has done so cynically. The political capital granted to Vietnam by the US in its efforts to court Hanoi appears to have been spent to eliminate highly symbolic figures among US-funded networks aimed at compromising Vietnamese sovereignty and pressure Vietnamese policy making. It remains to be seen how far Washington will push Hanoi regarding the jailing of US-funded agitators. 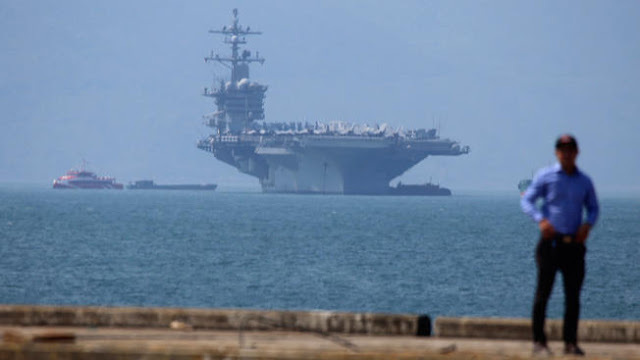 Other members of US NED-funded fronts across Southeast Asia, including YSEALI alumni will likely suffer a crisis of confidence over US indifference to their jailed counterparts in Vietnam if the US fails to act. However, if the US does act, it will lose one of the last nations in the region willing to work with Washington regarding Beijing. Perhaps then a pan-Asian effort to finally uproot and expel permanently aspects of US and European "soft power" can begin.